Whilst we've had support for Gitlab repositories for some time, we've recently deployed full support for Gitlab via OAuth as well as the ability to trigger automatic deployments using both the Community and Enterprise versions. To add your Gitlab repository now, just follow the usual method of adding a new project, and you'll see that Gitlab shows an option next to Codebase, Github and Bitbucket. Just like with the other hosts, Deploy will then present you with a list of your Gitlab repositories, and once one is selected the process of adding the repository and it's necessary deployment key will be taken care of automatically. 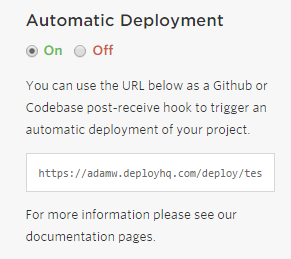 Adding a webhook to start automatic deployments is the same as any of the other supported services; just navigate to your server settings in Deploy, and copy the automatic deployment URL to your clipboard. 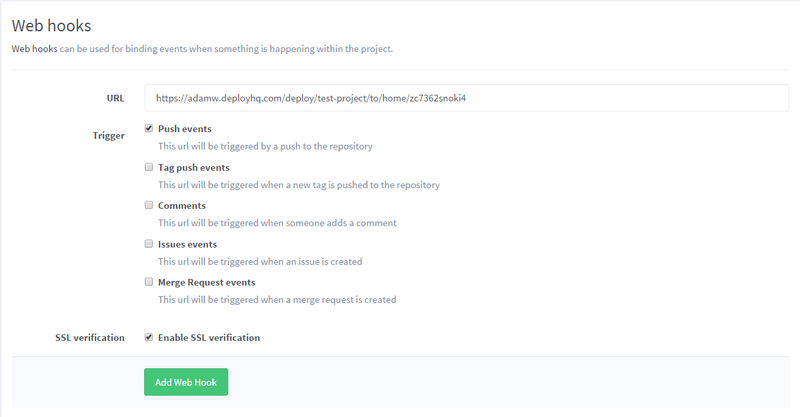 Then in Gitlab, navigate to your repository's settings then to Webhooks, and add the URL into there. As always, please get in touch with us if you have any questions to support@deployhq.com.